I saw Mockingjay Pt 1 last week, and I really enjoyed it. I've heard critics say that it didn't have enough action. Don't we have plenty of action in Hollywood? Don't we need more of what Mockingjay was all about? A bigger game, subtle moves and counter-moves, twisted political ethics, repercussions that make the main characters question everything they're doing, an exploration of heroes' motives? I really liked it. I know it didn't capture everything in the book, but I think it did pretty well. Good job, everyone! As the daughter of the town scavenger, Mari grew up knowing hardship, but she could have never anticipated the struggles facing her as an adult. Feeling alone and isolated, she dreams of a better life. On the other side of town, a little girl is forced to live on the streets, but silently she longs for the one thing she’s never known—a family. Max, a struggling American photojournalist, arrives in China with only one goal in mind; to face his demons and put an end to his own unbearable suffering. In Red Skies, the fate of three people who’ve never met will converge in profound and unexpected ways. From the bestselling author of 'A Thread Unbroken' comes a fresh glimpse into the life of Benfu's remarkable family. 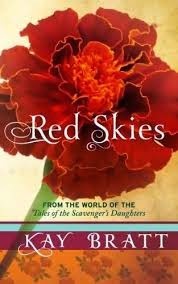 Be swept up in this emotional yet hope filled story of Red Skies, the fourth book set in the world of Kay Bratt’s 'Tales of The Scavenger’s Daughters'. This story is set in China, in a world so different from what I know, and I really enjoyed learning about the culture and food and daily life there. I didn’t mind the somewhat predictable ending, because it was one of those satisfying moments you’d waited for, and I was happy for the characters. There were a few plot holes and unbelievable bits. I especially couldn’t understand how intelligent, sensitive Mari didn’t guess what might have happened to Max’s daughter. However, these issues didn’t stop me from enjoying the story. It could have done with a little trimming of the repetitive thoughts and explanations, but overall the writing was good: warm and engaging. And I LOVED the part where the two girls wove their own mythology around the photo of Max’s daughter. Great touch. I would read more of Kay Bratt’s work. Twenty-five years ago, On November 9, 1989, the Berlin Wall fell, and that’s what most Americans remember about the beginning of the end of Communist control in Eastern Europe. 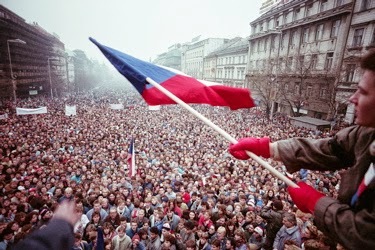 A week later, demonstrations started in Bratislava. 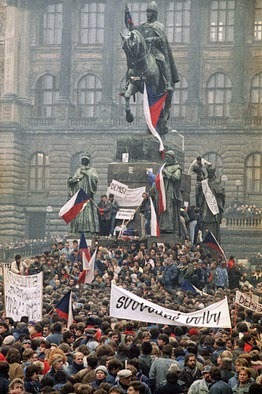 On November 17, high school and university students began protesting in Prague. Over the next few days, demonstrations sprang up all over Czechoslovakia, and as many as 500,000 protestors had banded together in Prague. Keep in mind that the current population of Prague is only about a 1.2 million. On November 27, the top dogs of the Communist party in Czechoslovakia all resigned. By the end of December, walls and fences had been torn down along the borders with Germany and Austria, parts of the constitution had been changed, and Vaclav Havel had been elected president of the first democratic government since the war. Not a single person died. And thus comes the name: the Velvet Revolution. Today is a public holiday here in the Czech Republic, where I’m living. There’s a party down in the park later, special programs on TV, and I just heard sametová (the word for velvet) on the radio. Last week, one of my classes had an assignment to bring in a photo that was important to them and describe what was happening in it. I assumed they’d bring family photos. Out of six students, four for them brought pictures of the Velvet Revolution: flag-waving protestors, peaceful demonstrations, Vaclav Havel before he became president. They told me how the crowds had grown and grown, and how the masses sang for freedom. Out of those six students, only one remembers the Velvet Revolution. The rest weren’t even born yet. Still, it holds an important place in their hearts. In another class, I asked if anyone there remembered. One student raised her hand. “I was in university,” she said. “I went to the demonstrations. In the middle of it, I didn’t believe things would change.” But they did. And now my older students—who once had to do gas-mask drills in school, just in case the Americans attacked—have me for a teacher. Sometimes words and songs and hands without weapons can change the world. These are pictures from my foggy and mysterious hike this morning in the hills above Vsetin, Czech Republic. Nature is so dynamic! Yesterday I hiked with friends to Pulčínské Skály, near Lidečkoin the Czech Republic, and then on to Huslenky. It was a great hike, misty and mysterious in the morning, blue-skied by the end, and all of it through the colorful last gasps of fall. I love the Czech countryside! This was my second time at Pulčínské Skály. If you want more specifics, check out my travel article about the trip on Go Nomad:"Wallachian Rock; Off the Beaten Track on the Czech-Slovak Border"
This is Vsetin's town park, which I get to walk past every day on the way to work. Lucky Me! I love watching the seasons change here. November 2: A beautiful day to remember the dead.